Last Saturday morning, my parents drove out to The Berry Patch to handpick pounds of juicy plump blueberries. They called me to let me know they had a little treat to drop by, and brought over a huge bag of berries that were bigger than grapes and so sweet. We couldn't stop popping berry after berry into our mouths - they were so ripe and sweeter than sugar. We decided to invite over some company for dinner that night, so when I was scrambling to make a nice dessert full of summer flavor, I knew those blueberries were my perfect inspiration. I whipped together this delicious pie in no time (seriously, it was so easy peasy), and I knew by sighs and the taste bud inspired groans that this was a home run. The melt-in-your-mouth crumb topping perfectly enhances the fresh berries. A must try this summer! 2) Lay prepared pie crust shell over a 9 inch pie pan, and gently press dough into the bottom and sides until it is formed to the plate. 3) In a large bowl, stir together the sugar and flour until combined. Slowly stir in the grated lemon zest and lemon juice. Once blended, gently stir in the blueberries until they are coated in flour mixture. Pour into the pie crust. 4) In another bowl, whisk together the brown sugar, oats, flour and cinnamon. Next, cut better into small pea sized pieces and mix in with forks or hands until mixture is crumbly. 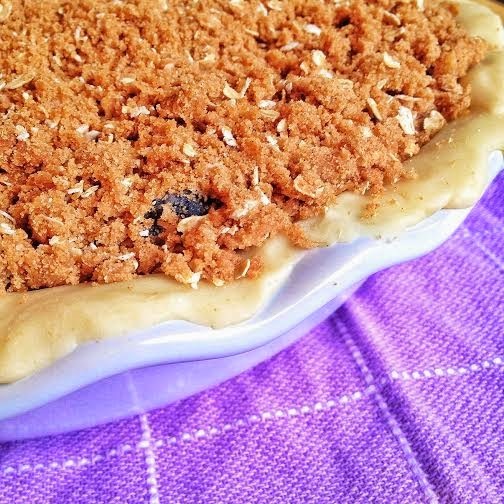 Lightly sprinkle the crumb topping evenly over the pie filling until top is covered. 5) Place the pie in the middle of the oven and bake for 40 minutes, or until crumb topping is lightly toasted and golden. Remove the pie and place it on top of a wire rack to allow to cool. Serve pie warm and top with vanilla bean ice cream and a sprinkle of cinnamon. Once this pie was in the oven the whole house was filled with scents of cinnamon and fresh, plump blueberries. Our mouths were watering, and I could barely keep my husband from picking at the pie before it cooled.